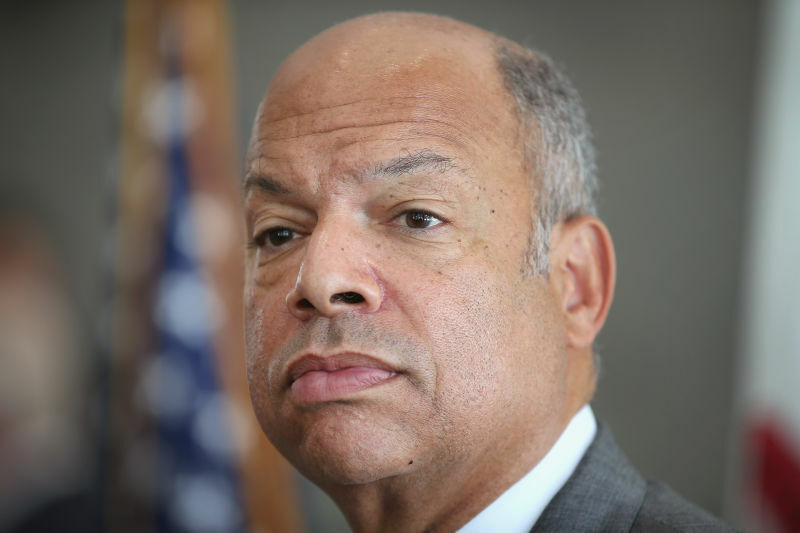 U.S. Secretary of Homeland Security Jeh Johnson's talk at UC Berkeley Tuesday night included a heated verbal exchange that lasted several minutes, after an immigrant rights activist interrupted him at high volume. In a video posted to social media, Sandy Valenciano, an organizer with the California Immigrant Youth Justice Alliance, can be seen standing across the room as she loudly pressures Johnson on U.S. Immigration and Customs Enforcement’s deportation policies. Titled “Threats to Homeland,” Johnson’s talk was organized by the Berkeley Forum, a student-led organization created in 2012. The event drew around 300 attendees. “Are you done?” Johnson asks in response. “I am not done,” Valenciano shoots back. She was joined by several others affiliated with her group, a statewide coalition of immigrant youth organizations. She later said in an interview that the coalition had repeatedly contacted the Department of Homeland Security to seek clarity on the Priority Enforcement Program -- a new system for local and state law enforcement to partner with federal immigration officials. The program, sometimes referred to as PEP-Comm, was announced last November to replace the controversial Secure Communities Program. Secure Communities began in 2008 as a collaboration between ICE and local law enforcement agencies, to facilitate deportation of individuals arrested for crimes. In November, President Barack Obama issued a directive to end the controversial program. Activists have stressed that deportations can separate families and cause upheaval in individuals' lives. Under ICE's PEP program, fingerprints of individuals booked for criminal violations are automatically sent to the FBI for criminal history and warrant checks; that biometric data is simultaneously sent to ICE. If ICE deems the individual to be a “priority for removal” based on these records, they can ask the local law enforcement agency to notify them before releasing the individual from custody. The issue of police cooperation with immigration authorities has been a topic of debate in recent months, following the July 1 shooting death of Kate Steinle on San Francisco’s Pier 14. In that case, controversy centered on how the San Francisco Sheriff’s Department handles ICE requests. Sergey Mann, a junior economics major at UC Berkeley who serves as public relations manager for the Berkeley Forum, said his organization seeks to encourage student dialogue with influential figures. In the past, the Berkeley Forum has hosted big names, including Sen. Rand Paul, (R-Kentucky) and venture capitalist Peter Thiel, whose appearance was cut short last December when protesters stormed the stage. For events such as Johnson’s talk, which drew a large crowd, he said the typical format is to ask members of the audience to submit their questions on cards at the start of the program.